You are currently browsing the tag archive for the ‘Bachelor Party’ tag. Well, I went to see “The Hangover” last night… I think. To be honest I can’t remember. What the hell happened last night?! Okay, let’s see. Met up with Wayne and Kathy around… nine o’clock? We picked up Karen from work… went to the theatre. The Arclight, right? No! It was in Woodland Hills. We went to a late show, or maybe we had dinner? Come on Darby! Check your pockets. Maybe there’s a ticket stub in there. Let’s see, a pen cap, some change, and a wooden nickel? Where the hell did I get a wooden nickel? Here we go. A ticket stub to “The Hangover” at eleven fifteen at AMC. And what else do we have here? It’s a fortune from a fortune cookie? Where did that come from? I remember now. We got to the movie early and went to have dinner at P.F. Chang’s. Oh man, no wonder I can’t remember anything. I’ve seen “The Food.” I know that P.F. Chang uses M.S.G. Okay, fun time is over; let’s get on to the review. Hands down the best movie of the summer! No, really. I went to see an advanced screening of “The Hangover” back in March and wanted to see it again immediately. Unfortunately, I had to wait three months before I could see it again. A long three months later, I’m pleased to say I enjoyed it just as much, if not more. The movie really is air tight. It’s just a non-stop laugh-fest. Zack Galifianakis steals the show, which is fantastic because I’m a long time Galifianakis fan. I have been waiting for him to get a project that would bring his genius to the masses, and I’m happy to say this is the one. But if this is your first time seeing Galifianakis in action, and you think he’s hysterical, please do not hold “G-Force” against him when it comes out in July. The only performance that comes close to upstaging Zack is that of his baby co-star. The faces this kid makes are unbelievable. I mean it. That baby has to be CGI, there’s no way that’s a real baby. Okay, let’s get to the plot breakdown; not that I have to tell you what the movie is about, I’m sure you’ve seen the trailers that give away everything. If you haven’t, here’s a breakdown that doesn’t give anything away. 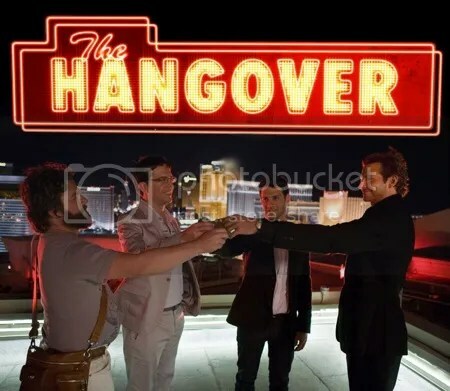 Three buddies, played by Bradley Cooper, Ed Helms, and Zack Galifianakis, take their best friend Doug (Justin Bartha) to Las Vegas for his bachelor party, and a night they’ll never remember. With no memory of the events that took place the night before, the guys wake up to discover that not only is Doug missing, but they only have 40 hours to retrace their steps and find Doug before his wedding. This movie really does have it all. The script is hysterical from beginning to end. I’m not even going to hold the screenwriters’ last script, “Ghosts of Girlfriends Past,” against them. Director, Todd Phillips, keeps the pace of the movie moving, almost to a fault. At times you actually feel exhausted because you truly don’t stop laughing for such a long period of time. 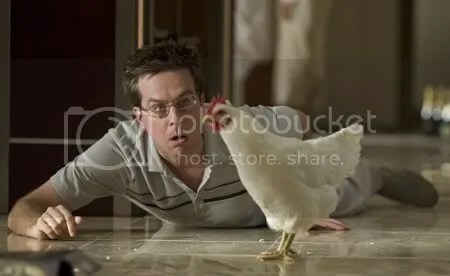 The locked-off camera shot of Ed Helms, when he first wakes up is fantastic. Heather Graham stands out; with a charming performance that reminds us why we fell in love with her as Mercedes Lane in “License to Drive.” The cast works so well together that it was of no surprise to me that Warner Bros. green-lit a sequel more than a month before the film’s release. “The Hangover” is destined to be a comedy classic, with the likes of “Animal House,” “Caddyshack,” and “Bachelor Party.” I just hope the sequel can live up to the incredibly high standard set by the first film.